"Dear World Live From Emory" is part of a diverse slate of events planned for Social Justice Week, set for Feb. 22-28. Emory's annual Social Justice Week, set for Feb. 22-28, features a new event combining photography and words to share the stories of the students, faculty and staff who make up the University community. 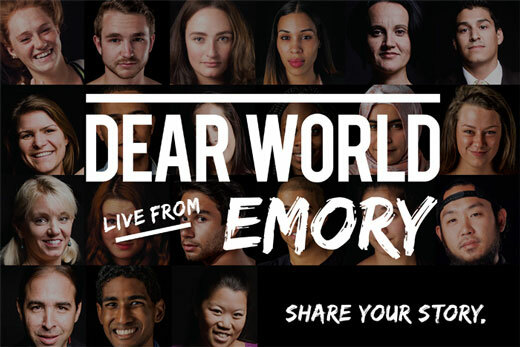 “Dear World Live from Emory” includes a photo shoot on Thursday, Feb. 25, from 9 a.m. to 3 p.m. in the Coke Commons of the Dobbs University Center (DUC), followed by a reception at 7 p.m. in Winship Ballroom. The event is sponsored by the Residence Hall Association (RHA). Members of the campus community, including students, faculty, and staff, are encouraged to stop by the Coca-Cola Commons to get their photo taken and “to write a word or phrase that is salient to them and their lived experiences,” according to Courtnay Oddman, RHA co-adviser. Community members are also encouraged to nominate a student, faculty member or staff member to attend the VIP Photo Shoot the evening of Feb. 24. Self-nominations are welcome. Up to 50 of the nominated individuals will be selected by the Residence Hall Association Executive Board to attend the VIP event the evening before the keynote reception to share their stories and have their photos taken. “We are looking for community members who have impactful lived experiences and stories,” says Ambra Yarbrough, assistant director for New Student and Transition Programs. Out of all the stories shared and photos taken, several people will be chosen to come on stage to share their stories during this keynote presentation. The main keynote is Jonah Evans, the Dear World executive producer, who will talk about the importance of engaging in dialogue. “By the end of the night you will realize that through our stories, there’s actually much more that brings us together than what keeps us apart,” says Adams. Director of Residence Life Scott Rausch notes that “Dear World" is intended to "harness the power of both visual and written stories, allowing the campus community to come together to celebrate their commonalities and differences." On Tuesday, Feb. 23, “State of Race” features National Public Radio special correspondent Michele Norris. Her talk, set for 6 p.m. in the Cox Hall Ballroom, is the big event of the week, notes Alyssa Weinstein, president of the College Council. On Wednesday, Feb. 24, Arts Expression Night will be from 7 to 9 p.m. at the Media, Literature, and Arts Outreach (MLAO) theme house, 14 Eagle Row. This event is in partnership with the student organization, The Pulse. It will allow students to express what they believe social justice is via mediums of performance and visual art, such as spoken word, dancing, singing, essay writing, poems, drawings, and paintings, according to Semmie Lee, vice president of programming for the College Council. Sign up to perform or showcase art. Snacks will be served at the event. On Friday, Feb. 26, an education discussion, “Students on the Frontline: The Struggle Against Modern Educational Segregation in the South” sponsored by Freedom University will be at noon in Eagles Landing in the DUC. Lee says this discussion will include the fight for undocumented students to attend college. Friday evening at 7 p.m., City Year is sponsoring the film “All the Difference” to be screened in 205 White Hall. “All the Difference” is described as a feature-length documentary film that explores critical issues and offers insights and solutions related to African American manhood. On Sunday, Feb. 28, the College Council will sponsor visits to the National Center for Civil and Human Rights from 11:30 a.m. to 6 p.m. Experience shuttles will depart from Woodruff Circle. Lee says the College Council chose Inquire to Action as the theme to help continue the conversation on social and racial justice with the hope that participants will take more action on these issues throughout the remainder of the semester.